OTTAWA -- Canada and Mexico moved Tuesday to rid themselves of long-standing trade and travel irritants, touting their relationship as a model against the growing strains of protectionism and isolation in the U.S. and Britain. Prime Minister Justin Trudeau said Canada would lift its controversial visa requirement for Mexican visitors before the end of the year, while Mexico said it would end long-standing restrictions on Canadian beef imports. Although both changes are still months away, Trudeau and Mexican President Enrique Pena Nieto expressed satisfaction that the two main irritants in their bilateral relationship would be removed, paving the way for deeper co-operation. 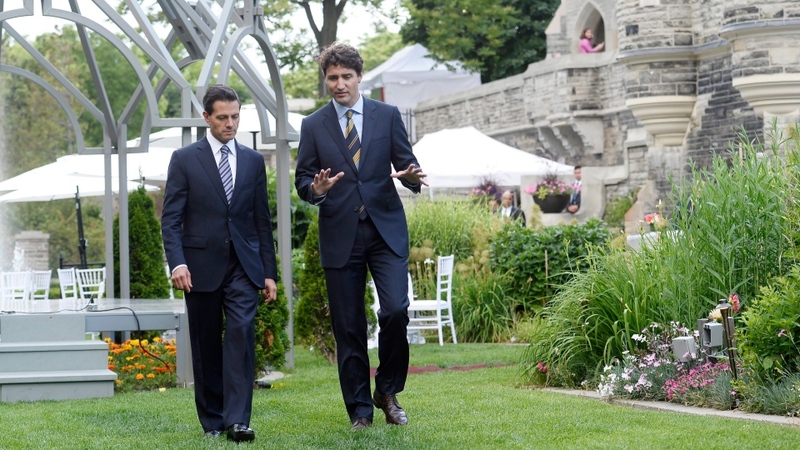 Pena Nieto was on Day 2 of a three-day visit to Canada, which culminates in the North American Leaders' Summit, taking place Wednesday at Ottawa's National Gallery of Canada with Trudeau and U.S. President Barack Obama. The protectionist rhetoric coming from the presumptive Democratic and Republican presidential candidates, along with Britain's blockbuster decision leave the European Union, will add a counterpoint for the three leaders as they present the continent as a region of economic and political co-operation. 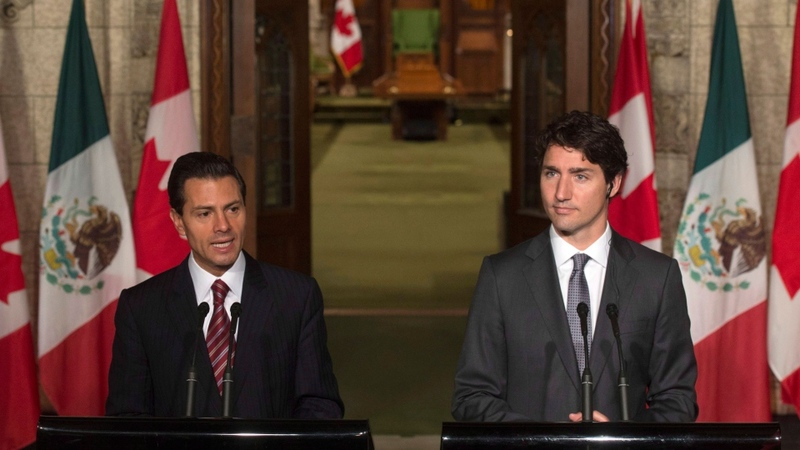 Trudeau called the Mexican-Canadian partnership an example to the world. "That's a compelling example that we want to showcase at a time where, unfortunately, people are prone to turning inwards, which will, unfortunately, be at the cost of economic growth and their own success in many situations." The visa requirement will be lifted by Dec. 1, while the beef ban ends in October, he said. Ending Mexican restrictions on Canadian beef, a lingering side effect of long-standing fears over mad-cow disease, "will support Canadian farmers and Canadian families," he added. The previous Conservative government imposed visas in 2009 to stop thousands of asylum claims being made by ineligible Mexican citizens -- a controversial move that has stood as the major irritant between the two countries ever since. "Since 2009, this barrier has been set, but today thanks to a great political will, we are overcoming such a barrier," Pena Nieto said in Spanish. Conservative immigration critic Michelle Rempel said in a statement that Trudeau was making "a political decision that puts the security of Canadians at risk" by lifting the visa. "The decision to lift the visa appears to be a completely political quid pro quo, rather than a decision based on evidence and Canada's national interest." The two countries also agreed to work together to advance the interests of indigenous people in both countries, in particular to help women gain access to education and foster innovation and entrepreneurship, Trudeau said. Along with a variety of courtesy calls and photo-op events, the Mexican president also attended a youth event on Tuesday before a state dinner hosted by Gov. Gen. David Johnston at Rideau Hall. Earlier Tuesday, Natural Resources Minister Jim Carr told a forum on innovation that Wednesday's summit takes place just as similar agendas -- transitioning away from fossil fuels and racing towards energy innovation -- are seizing governments around the world. Carr called it "an absolutely important moment as the history of the world begins to adjust to these very important changes." "Remarkably, as we talk to each other and as we travel internationally, the agenda of the world is remarkably similar," he said. "And that is that we are all in a transition phase where we are reducing the reliance on fossil fuels and increasing our investments in renewable sources of energy, and in innovation." On Wednesday, Pena Nieto will sign Mexico on to the Canada-U.S. methane reduction deal announced when Trudeau paid a state visit to Washington in March. That accord pledges to cut methane emissions 40 to 45 per cent below 2012 levels by 2025. The three leaders will also announce a goal to achieve 50 per cent of clean power generation across North America by 2025, including renewable energy, nuclear power, carbon capture and storage and cutting energy waste through increased efficiency.